Right off the bat, we’d like to warn you that there are two extremely different packages of Zico Coconut Water. First are the 11oz tetrapak containers, which are the square packages that look like other brands of coconut water. These containers are made of 100% natural coconut water, and we endorse their use. However, the second variety of Zico Coconut Water are the 14oz plastic bottles. These bigger bottles contain coconut water that is made from concentrate along with some unknown added “flavoring” and do not get our seal of approval. In our opinion, the made-from-concentrate coconut water does not taste as good (Amazon reviewers agree). It is also important to note that in 2009, the Coca-Cola Company invested in Zico Coconut Water, which may have been the driving force behind the coconut water that is made from concentrate. We are all for Zico Coconut Water, but please make sure you purchase the 11oz TetraPak containers! Zico offers people the taste of a coconut without having to endure the hassles of breaking open a coconut. Coconut Water Zico makes in the TetraPak containers is 100% natural and is about 99.9% coconut. In Asia and other tropical countries, Coconuts are enjoyed every day. However, in many countries like America, coconut and their products are much harder to find. With this drink, you can now have great taste coconut wherever and whenever. On the other hand, the 11-oz bottle contains pure coconut water. The 11oz bottles have three flavors: Natural, Mango and Passion Fruit. The founder of Zico is actually an athlete who was looking for a healthier alternative to drink. Since he would drink coconuts during rehearsals, he planned to introduce this wonderful drink to the world. Zico has a mission to let people know that drinking natural products is much better than other artificial drinks. They believe in Zico Coconut Water not because they made it but because they themselves have experienced the benefits that it offers. The different uses of coconuts have been known by tropical islanders, Latin Americans, and Southeast Asians for centuries and centuries. More than 4000 years ago, coconuts were already being used as a rehydrating agent. Since it is so sterile, isotonic, and contains the same electrolytes as our human bodies, it can even be used as an IV fluid in an extreme emergency! Any thirsty athlete or person can get rehydrated once they drink coconut water. It also has a content that can help prevent cramps. Weight loss and fat-loss can also be facilitated if combined with the proper diet and using Zico Coconut Water in substitution of artificially flavored drinks that contain refined sugar and high fructose corn syrup. Coconut water contains water, sugars, and is made up of 5 electrolytes. These electrolytes are magnesium, phosphorous, sodium, calcium and potassium. 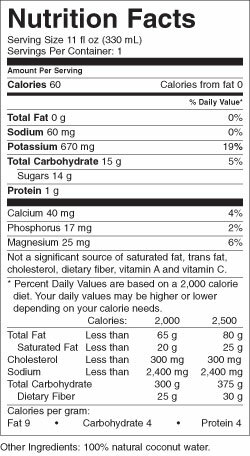 In fact its potassium content is 569mg which is more than the potassium content of one banana, and also more than 15 regular sports drinks! Aside from this, it does not contain any preservatives or fats. Refined sugars are also not a part of Zico Coconut Water, although coconut water does contain its own natural sugars. It also has lower acidity as compared to other juice drinks. 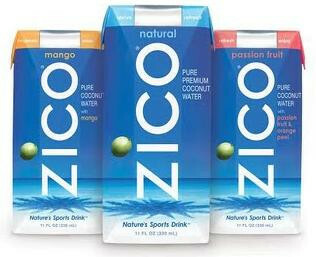 The 11oz packages of Zico Coconut Water comes in Natural, Mango, and Passion Fruit flavors. The 14oz bottle of Zico Coconut Water comes in the flavors of Natural, Piña Tropicale, Tao Mango, Pomberry. So far, Zico coconut water reviews are a mixed bag. The 11oz packages score incredible reviews, as they are completely natural coconut waters. I have even read a review where the reviewer stated that Zico coconut water’s natural flavor is referred to as pure coconut heaven. However, there’s been a bit more of a backlash on the content of the 14oz packages, which are made from concentrate, have added flavoring, and simply don’t taste as good. Customers who has already tasted the healthy benefits of 11oz Zico Coconut Water typically don’t go back to drinking artificially-flavored drinks anymore. Where to buy Zico Coconut Water? In America, it’s very difficult to find coconut water still – especially in the South, Texas and the Midwest. This is why we recommend buying coconut water online! You can score free shipping, and the product will not spoil since the asceptic packaging keeps the extremely-sterile coconut water good for over a year. The deals online are far better than at specialty health stores, which is why you should also buy Zico coconut water wholesale online. I really like this coconut water but I haven’t seen any reaction to the fact that they are packaging their “healthy” drink in a #7 recyclable, non-BPA free bottle. Just another reason to buy it in the square box version or buy a different brand as I’m not sure what lines the cardboard drinkbox. Why would a health product be packaged so carelessly? It’s always money I suppose but it seems bad PR for healthy product. I have found a different Coconut water in a glass bottle that I drink instead. Actually the bottle is BPA free, why say BPA free if there has never been BPA in that type of plastic. Also, if you look closely it is #2 compatible which is widely accepted as opposed to tetra paks which most recycling facilities can’t handle due to the fact that it is paper, plastic, and aluminum all together….check your local facility to see if they can handle the tetra pak. Also, I’m pretty sure being from concentrate has nothing to do with being a natural product.